The weekend aquatics program is designed to provide fun aquatic opportunities for Scouts and their families. Units plan their own full-day programs. After a brief safety overview, unit leaders are responsible for overseeing self-guided activities in and around Alamitos Bay in the Long Beach Marina using our private beach and equipment. Note: This is not a merit badge class. This program is offered any weekend throughout the year on a first come, first serve basis. Reservations required and can be made through this reservation form here or the Scout Service Center (562) 427-0911. Canoeing: Access to canoes. Ideal for skills practice and leisure. Rowing: Access to row boats. Ideal for skills practice and leisure. Kayaking: Access to kayaks. Ideal for skills practice and leisure. Stand-up Paddleboarding: Access to paddleboards. Ideal for skills practice and leisure. Island Excursions: Trips around Naples Island & Alamitos Bay. Free Swim: Access to private beach to enjoy swimming. BBQ: 3 Charcoal grills and 1 large propane grill available. Fire Ring: Patio fire ring with bay view available. Sea Base Spring Sailing Season (Saturdays only) is designed sailing skills, proficiency and theory as well as rules of the road and safety. Part classroom instruction by highly-trained staff with mostly on-the-water coaching while you practice and drill utilizing our fleet of Sabots, Lidos, and FJ’s. This 10-week session will culminate with a fun regatta to compete using your new skills! WHEN: 10 consecutive Saturdays from March 16 – May 18 from 10:00am to 1:30pm. It is okay if some Saturdays are missed (bring a sack lunch). WHO: Any registered Scouts and Scouters ages 5+ (Cub Scouts must have a parent participant). You must have completed Safety Afloat training. You are also required to be in good physical condition and pass the BSA swim check given the first day. Will be provided: Classroom instruction and on-the-water coaching in dinghy sailboat techniques and safety. The Long Beach Sea Base is one of the premier waterfront Scouting facilities in the country. It is located at 5875 E. Appian Way in beautiful Belmont Shore, under the 2nd St Bridge. 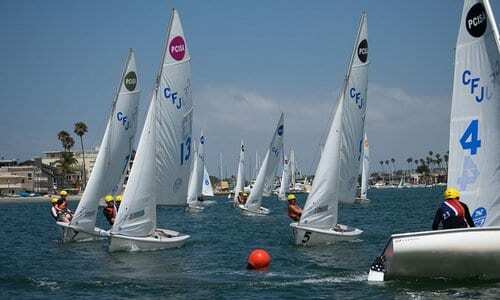 All activities are conducted within the confines of the Sea Base and Alamitos Bay Marina. Any group wishing to go outside of the marina must make separate arrangements well in advance.